Back in the day, the keyword was the most important term for an SEO expert. Although it is still crucial during the SEO strategy for higher search rankings, it has lost a lot of its value when it comes to content creation and for on-page SEO techniques. And that is why you might ask; what is meant by LSI keywords? What is meant by LSI in SEO? What is latent semantic indexing used for? And here we're going not only to find LSI Keywords but also to know smartly implement them for SEO. To know better about the "Semantic Web", let's understand new SEO techniques which demonstrate you about what are LSI keywords used for & how to find it for better SEO that'll drive more organic traffic to your website. By using LSI keywords and after quick researching around SEO; I’ve been able to provide the boost to my existing content and jump to the top of search results with updated re-edited content. 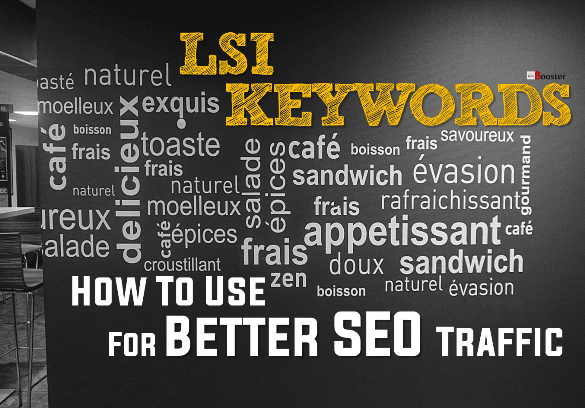 In short, LSI keywords helps to improve your SEO dramatically. Nowadays, Google no longer focuses on one keyword when assessing the importance of content. Google is regularly updating its algorithm. Instead, an article as a whole needs to be judged. You cannot simply spam one word or a phrase hoping to get results. The 'Semantic Web' is nothing but the SEO technique used to understand for the machine to crawl your content in index your pages quickly. The 'Semantic Web' makes your high-quality contents understandable to the machine readers quickly. The LSI keyword is the better SEO technique used to decode the way how your quality content included targeted keywords. The LSI keywords typically used as an essential part of your SEO strategy. LSI is the fundamental part of Google algorithm helps to remove the low-quality content like keyword stuffing. Instead, you better need to focus on natural sounding and use of synonyms. And with that, we come to LSIs. In the previous article, we have seen Top 6 On-Page SEO Factors To Consider Before Building an SEO Optimized Web Page | Web Content Optimization and its the most popular page on problogbooster. And today we are going to see how LSI help to improve PageRank of your website. LSI refers to Latent Semantic Indexing. Basically, it is a concept that establishes a connection between different words and phrases. In that regard, one word will not suffice. However, you can do wonders with a particular set of words and phrases. When you write an article about fruits, it is highly unnatural not to have words such as agriculture, food, vitamins, etc. In a normal situation, all of these are synonyms and related phrases which instantly pop in our head as soon as we mention the particular keyword. Nowadays, Google establishes the relevancy of an article not based on one keyword, but a set of keywords. Having fruit in your text doesn’t tell us a lot about the article. It may be about health, bodybuilding, agriculture, cartoon, movie, business, etc. With LSI keywords, Google can be certain that the article is about something in particular. When it returns results, it will be based on user’s intent, not on a single keyword. As we mentioned, there are numerous ways Google’s algorithms can assess content. Each word within a text can suggest something completely different. However, the search engine can safely presume general theme of the article.Latent semantic indexing is very important during this process. It determines whether a certain phrase should be present within a text and in what quantity. Keywords Repetitions are based on the correlation between the words. Let me expand on that. You wish to create an article about “Laurel and Hardy.” It is only normal that you should have both words in the same proportion. For each mention of Laurel, there should be one mention of Hardy. If for example, Laurel is much more mentioned than Hardy, you can safely presume that the article mainly revolves around Laurel. Every next word help establishes the importance of the content. If after “Laurel and Hardy” the most used phrase is awarded, Google will presume that the text is about their achievement. On the other hand, if the second most frequent phrase is movies, it is probably a list of their movies. All of these keywords correlations are important, and if you wish to rank for a certain phrase, you need to establish the necessary frequency of the important but targeted keywords. How do I use LSI keywords in a text? Your best method is to write an original natural copy. If the article is good enough, it will consist of all the targeted keywords that are required for Google to make the connection. However, even with your best efforts, you might omit some of the phrases that are crucial for establishing intent behind a copy. This is why you have to perform additional SEO polishing. After finishing your article, you should go and check top 10 competitors. By analyzing their pages, you are able to determine which phrases are the most important how often they repeat themselves. This allows you to approximately structure your content. However, try not to overdo it. These are only pointers, not the general rule. Enough with the theoretical stuff. It’s time to get practical. Let me show you four great ways to find latent semantic keywords for your article. The first way you can find LSI keywords for your articles is by just writing your targeted keyword into the search box of Google or any other search engine and check the top 10 suggestions it shows you automatically. Before using this feature, make sure to turn ON the 'instant search' feature for your browser in case if you had previously set it OFF; else this trick will not work properly for you. After you type targeted keywords in the Google's search box and just scroll down after SERPs to the bottom end of the results page. You will get more 8 additional suggestions you can add them to required LSI keywords chain. Just make sure to avoid negative keywords and use only related & targeted keywords for better results. Analyze the keywords chain from a readers perspective and not from the Google point of view. Because you don’t need to use LSI words suggested by Google, like “car repair London cheap” in the write-up despite the fact that Google suggests you do this. It doesn’t make any sense to the readers. Instead, you should tweak your LSI keywords into something like this “if you’re looking for a cheap car repair service in London…”. This is much better, right? Search for bolded terms on the Google result page. These are LSIs ready to use! When you perform a search, you’ll notice that Google shows certain words in bold text. Because the search engine considers these terms as closely related to your search string. In other words, these are considered LSI keywords. Whenever you notice some words or phrases in the bold format just keep in mind to use them in your content. This will help you to make your content more relevant and topic-oriented to your subject and site niche. What is latent semantic analysis and how Google tools used for LSI? If you have already used the previous three methods for finding LSI keywords, it will be a good time to start using some tools to enlarge your list. Ad group ideas – this is a much-underestimated option but is one of the best sources for LSI keywords you can ever use. Just type your main keyword in the tool, go through the list of suggestions and try to use targeted long tail keywords as many as possible while writing high-quality content for your website. Of course, don’t forget to use only those that would make sense. Keyword ideas – this helps to find niche keywords & everyone knows this feature, but I bet that only a few of you have really applied it to find LSI keywords. The keyword ideas tab will generate a long list of semantically related terms you can start incorporating in your copy straight away. Google constantly tries to improve user experience by presenting better and more relevant information. You can no longer focus on one word. Instead, the whole article is relevant. For now, latent semantic indexing is a term that is used to describe relations within a text. But, who knows? Perhaps one day, neither keyword nor LSI will be used as terms. There is the only thing which SEOs will mention is the text itself. Article By Nikolay Stoyanov - is the CEO of NikSto.com – an SEO company that offers SEO outsourcing, consulting and white hat link building services to clients all over the world. Nikolay is a huge Brian Dean fan and a proud graduate of his SEO That Works course. He’s a contributor to many of the most reputable websites about SEO.